A Revised Edition of Belbury Poly's jaunty debut EP. Belbury Poly are joined by label mates The Advisory Circle, who contribute the track Warm Air, a re-imagined Belbury track from the original EP. For many, the mid-00s will be the time that nu folk burgeoned and the likes of Devendra Banhart, Joanna Newsom and, towards the end of the decade, British darlings such as Laura Marling took things back to the power of one voice and a guitar, while legends such as Richard Thompson saw their stock continue to rise. Perhaps that’s no surprise. the end of the previous decade had been plagued by new Millennium fear and the threat of digital revolution implosion. In the early part of the 21st Century the Y2K bug was still fresh in the mind as Ghost Box put out their debut release, a limited 3" CD of electro beauty at odds with the burgeoning nu folkers yet, with its pastoral dreamscapes, more in tune with Britain's idiosyncratic folk tradition. Its three tracks come here expanded into a mini-album, with a "re-imagining" of Cool Air (as Warm Air) courtesy of labelmates Advisory Circle. not a million miles away from Eno’s Deep Blue Day, it’s a perfect primer for anyone afraid of electrical currents, yet curious for a new warm bosom. Closing (and new) track Hither & Thon approximates what it must sound like when crop circles are being made, while the title piece is a gloriously jaunty piece of fun, part 70s kid show, part rumbling lorry, part whirling synth dervish - a refracted and restructured nostalgia that Ghost Box would go on to perfect; and, indeed, continue to do so. 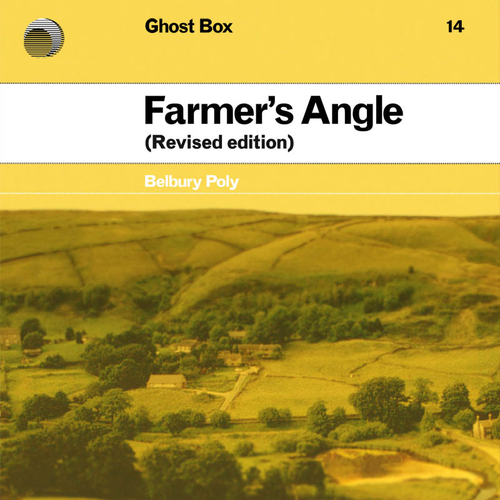 Following the recent revamp of The Advisory Circle's Mind How You Go, Ghost Box offer an enhanced reissue of their 2004 debut release, Belbury Poly's Farmer's Angle EP. Jim Jupp's disquietingly jaunty electro-folk gains additional presence and clarity in the transition to vinyl, with added interest in the form of three new tracks. "Your Stories" sound intriguingly like Lieutenant Pigeon and Jean-Jacques Perrey hosting a knees-up in the Belbury local, while "Hither and Yon" is in a similar vein to 2009's From an Ancient Star. The original EP's Lovecraft homage "Cool Air" has been replace by "Warm Air", a re-imagining courtesy of The Advisory Circle. Ghost Box purists may grumble, but as we have seen, Jon brooks is no slouch when it comes to building new worlds from old, and the latter's Satie-meets-Monkman drift makes for a worthy substitute. Unfortunately at this time we can't offer all the Belbury Poly - Farmer's Angle (Revised edition) tracks as individual flacs, as some of these tracks exceed the shops maximum (33.3333333333333mins) download length.